In the fall of 1934, my great grandfather Phillip Lesser was tragically killed by a car while walking home after worshiping at his congregation in Rome, GA. At the time, my grandfather Joe Lesser was in his sixth year of law practice in West Palm Beach. Following the funeral, my grandfather wrote a check and mailed it to Jerusalem in honor of Phillip to support the Jewish refugees moving to Palestine before it became Israel in 1948. Normally this would be the end of the story – but it’s not. 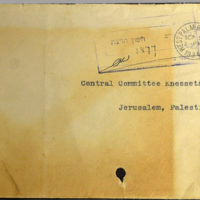 Last year, eighty-one years after it was mailed, I was made aware that the envelope my grandfather sent to Jerusalem was up for auction on eBay. Sadly, I was unable to obtain the envelope from the eBay seller and once again I thought the story was over. Little did I know a longtime good friend, Britt Deviney, had won the item from the seller and had decided to give it to me as an early Chanukah gift. This simple gift of an envelope reminds me how important people are in our lives. My grandfather started this firm on the premise that it important for lawyers to help people, as clients and to do whatever we can in the community to help make a difference. At our firm, we live by that mission every day – helping our clients and their families, and supporting charities and causes that can change people’s lives for the better. Working hard to help our injured clients and supporting the community is what has kept our firm going strong for 89 years and counting. This week, in honor of my grandfather, Joe Lesser, we will launch the inaugural “Envelope Campaign,” an annual campaign to support a different charity in our local community each year. This year’s campaign will raise funds for the Salvation Army, a charity Joe Lesser supported for more than 50 years in West Palm Beach. For 55 years, Joe Lesser practiced law in this community, helping his clients and people in need. Three generations later, I am proud to keep that tradition going with the rest of our law firm on board with that mission. This event kicks-off a series of charitable events Lesser, Lesser, Landy & Smith and its employees will be participating in over the next 12 months to celebrate the 90th anniversary of the Firm in West Palm Beach.